Clever, kindhearted Kubo ekes out a humble living, telling stories to the people of his seaside town including Hosato, Hashi and Kamekichi. But his relatively quiet existence is shattered when he accidentally summons a spirit from his past which storms down from the heavens to enforce an age-old vendetta. Now on the run, Kubo joins forces with Monkey and Beetle, and sets out on a thrilling quest to save his family and solve the mystery of his fallen father, the greatest samurai warrior the world has ever known. 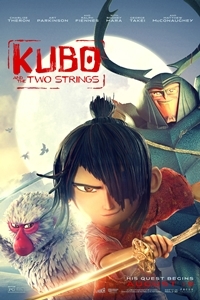 With the help of his shamisen - a magical musical instrument - Kubo must battle gods and monsters to unlock the secret of his legacy, reunite his family, and fulfill his heroic destiny.